Steve Bruce, center, founder of the Bruce Initiative on Rethinking Capitalism, walks through the audience on the first evening of the second Rethinking Capitalism at UC Santa Cruz. 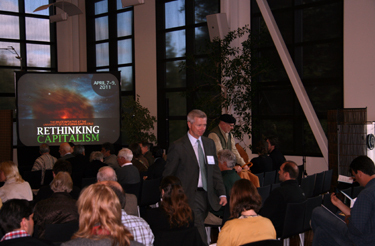 The second Rethinking Capitalism conference at UC Santa Cruz April 7-9 attracted large, attentive audiences – much from the Santa Cruz community – for three days of discussions on the perils facing capitalism and government efforts designed to prop it up. Steve Bruce, the UC Santa Cruz economics graduate who founded the Bruce Initiative on Rethinking Capitalism, said he was very pleased with how the conference turned out, noting that roughly half the audience was from the Santa Cruz area. "The high turnout shows that there is an interested community that looks to the university for information," Bruce said. Bob Meister, the professor of political and social thought who directs the Bruce Initiative, concurred. "The really gratifying change [from the first conference last year] was the intensity of the participation of the town, and the thoughtful and dedicated responses," he said. "We couldn't have accommodated more." In welcoming remarks, UC Santa Cruz Chancellor George Blumenthal, thanked the participants for attending and noted that the conference "follows in the footsteps of our founders, who imagined a place where the brightest minds would take the initiative to ask the big questions that benefit society." Horace "Woody" Brock kicked off the conference Thursday evening (April 7) with a talk that framed the issues on tap for discussion. At times pointed and funny, Brock, an economic strategist and president of Strategic Economic Decisions, emphasized that the economic system in which we live today is not capitalism. "Capitalism is the most remarkable institution devised but you won't recognize it because you don't have it," he said. "In Adam Smith's capitalism there is no finance,"
he said, offering one example. Under theoretically pure capitalism there would be no Goldman Sachs, Brock said, nor labor unions. 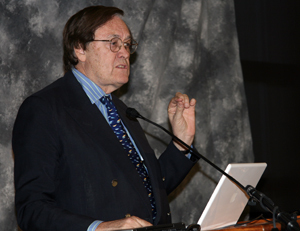 Meister said a key benefit of the conference is the bringing together of some of the top minds in the world today, many of whom hadn't met before. The three days forge exchanges of ideas and new collaborations, he said. "I didn't know these people and didn't know what it would be like for them to meet for the first time," he said. "It was better than I could have imagined." Meister said he expects more planned and unplanned events with the participants now that they are acquainted with each other.